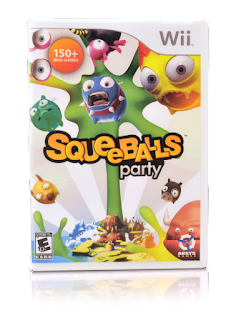 I was recently sent a copy of Squeeballs Party for Wii to review. The whole family loves games, so we were eager to try it out. We had a blast doing this review! Squeeballs are 12 toys that are manufactured on a secret island somewhere in the Pacific. Before they can be sold to children around the world, the Squeeballs must be fully put to the test...to the point of destruction! You can blow up, cook, slice, bat, bowl, shoot and bounce the Squeeballs. The game features a unique collection of 11 party games, each taking place in a different environment from lava-filled canyons, bowling alleys and kitchens to science labs and snow-capped mountains. As the game progresses and more challenges are met - each one more difficult than the last - the game showcases more than 150 unique challenges. The game is available for the Nintendo Wii, Nintendo DS/DS Lite/DSi, Apple iPhone and iPod Touch. The Wii version features 11 party games; other versions vary in content. "Squeeballs Party" is rated E10+ (Everyone 10 and older) with the descriptors "Cartoon Violence" by the Entertainment Software Rating Board (ESRB). Find more information at www.Squeeballs.com. The whole family enjoyed this game. There are lots of different mini games from bowling to tennis, paint by squeeball, even a cooking game of shorts. The squeeballs themselves are really cute and amusing to watch. This is one of the few games we have that we can all four play, so there is no fussing about who gets the next turn and all that jazz. It kept all of us entertained for quite awhile. I am happy to report that I can totally beat Dan on most of the games, a rare thing for me. We laughed ourselves silly and had a wonderful time playing this game. The entire family gives it two thumbs up. Squeeballs Party would make an excellent holiday gift. The price just dropped from $29.99 to $19.99 which is quite a bargain for a video game. You can find it at retailers nationwide. I am happy to have a copy of Squeeballs Party for Wii to give away to one reader. To enter, simply tell me what is your favorite game to play as a family. It can be a video game, board game, or whatever. This is mandatory for entry. Deadline to enter is 11:59pm CST on 12/17/09. Good luck! We love to play Yatzee, dominoes, and Eucher. #1 Got your "Holiday Gift Guide" button. #2 Got your "Holiday Gift Guide" button. #3 Got your "Holiday Gift Guide" button. We like to play Hide and Go Seek (my kids are 3 and 5 mos, lol). Our favorite game to play as a family is Sequence. I follow & I wish I had a blog.